Hi, I am interested in your 1975 Buick Le Sabre (stock #4981-CHA) listed on Autotrader for $16,995. I'd like to get more information about this vehicle and confirm its availability. This the end of the line for Buicks full-sized convertibles. 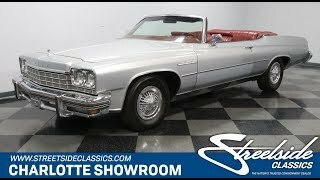 The 1975 Buick LeSabre Custom was the last year you could get a big, comfortable, and flashy machine in an attractive ragtop package. So when one of these rare finale cars has such low mileage and remains in a survivor-like condition (and yet is still a terrific cruiser with everything from A/C to a big V8) you know youre looking at a true gem. The Silver Mist paint is believed to be original to the car, and it still looks quite nice today. Of course, when youve averaged less than 700 miles annually, you expect a well-respected life like this. All the careful years also mean the sheetmetal looks quite crisp. So youll love showcasing the intricate design with the style line that starts above the grille and cuts an artful curve all the way to the taillights. This Buick really knew how to own the road with the wide grille, wider bumpers, and wire wheel covers. Its the extra-long and graceful look that we now miss on these full-sized convertibles. More than just a big, beautiful classic, its also rare with only 5,300 built in the final year... and just imagine how few have survived to look this good. While the black convertible top looks great against the silver paint, with the flip of a switch, it powers down to reveal a whole new dimension. The burgundy interior is equal parts sporty and sophisticated. On a survivor-grade car like this, its believed to be original right down to the button top seats. Speaking of the details, youll love everything from the plush carpeting, to the wood-like trim, to the factory AM/FM stereo. It feels like a true time capsule. The big size means plenty of room to share it with family and friends. But when its just you for a solo cruise, the fold-down armrest creates a very individual luxury feeling. And the cold-blowing air conditioning means you get to enjoy top-down motoring long into the summer season. Not only was this the last year for the LeSabre convertible, but this would also soon be the end of the road for Buicks famous big block. So its great to have true power with a 455 cubic-inch V8 and a four-barrel carb on top. The consignor states this is the original motor, and with the highly correct presentation, its hard not to believe him. This extra helping of power and torque to move the luxury machine with a bit of muscle car force. But it also never loses that smooth Buick luxury car feeling. In fact, its a great anytime classic thanks to the three-speed automatic transmission, power steering, cruise control, and front disc brakes. Distinct, powerful, and an absolute time capsule... this is an amazing affordable classic for the first person quick enough to grab this deal. Call now!